The Best Western Plus Medical Center South is close to the University of Texas Health and Science Center at San Antonio, Crossroads Mall, and South Texas Medical Center. It is adjacent to several restaurants and shops and walking distance to Marie Callender's restaurant. It is located between such major attractions as SeaWorld , Six Flags Fiesta Texas and Lackland Air Force Base. This hotel offers an onsite fitness center, business center, outdoor pool and guest rooms with 42-inch flat screen HD televisions along with free wireless high-speed Internet access. All rooms feature a refrigerator, microwave, coffee maker, hairdryer, iron and board. 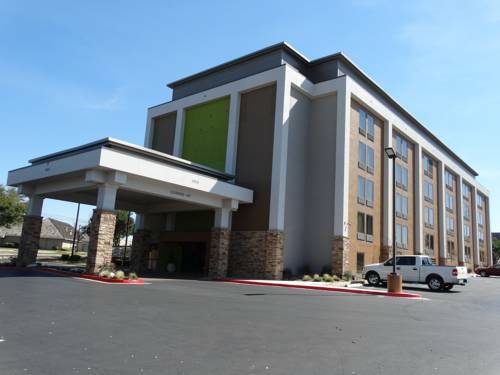 Guests love the location of our newly renovated hotel because we are just a few miles from St. Mary's University, UTSA with convenient access to both Interstate 10 and Loop 410 off Callaghan Road. 1.1 mile(s) from Zito's Deli, Deli, Greek, Open for: lunch, Easy going eatery offering a large variety of sandwiches including Italian subs and gyros. 2 mile(s) from Thai Restaurant, Full Service, Thai, Open for: lunch, dinner, Quaint, family-owned spot serving classic fare from pad Thai to Panang curry in a casual setting. 1.50 mile(s) from Subway , Deli, American, Open for: breakfast, lunch, dinner, Casual counter-serve chain for build-your-own sandwiches and salads with health-conscious options. 4 mile(s) from Grady's Bar-B-Q, Buffet, American, Open for: lunch, dinner, Long-running local chain dishing up plates and family-size portions of BBQ, fried catfish and sides. 7 mile(s) from Pappasito's Cantina , Full Service, Mexican, Open for: lunch, dinner, Great Dining. 4.5 mile(s) from Olive Garden , Full Service, Italian, Open for: lunch, dinner, Lively, family-friendly chain featuring Italian standards such as pastas and salads, with a full bar. Across the street from Donnie's Chicago Style Pizza, Deli, Italian, Open for: lunch, dinner, Casual counter for Chicago comfort grub, such as deep-dish and thin-crust pizza pies, hot dogs and sandwiches. 1 mile(s) from Popeyes Louisiana Kitchen, Fast Food, Cajun, Open for: lunch, dinner, Louisiana-accented fast-food chain known for its spicy fried chicken, biscuits and sides. 1.2 mile(s) from Danny's Cocina Mexicana, Full Service, Mexican, Open for: lunch, dinner, Small, homey hangout with a warm vibe whipping up an array of favorite Mexican dishes. 1.5 mile(s) from Whataburger , Fast Food, American, Open for: breakfast, lunch, dinner, Circa-1950 fast-food chain for counter-serve burgers, some stacked with multiple patties. 1.5 mile(s) from Nicha's Comida Mexicana, Full Service, Mexican, Open for: lunch, dinner, Spacious outpost featuring generous plates of Mexican fare and margaritas in a contemporary interior. Adjacent to Marie Callender's , Full Service, American, Open for: lunch, dinner, Veteran chain bakery/eatery famed for its pies and offering other American fare in a homey space. 5 mile(s) from Texas Roadhouse , Full Service, Steak House, Open for: lunch, dinner, Lively chain steakhouse serving American fare with a Southwestern spin amid Texas-themed decor. 1.25 mile(s) from Red Lobster , Full Service, Seafood, Open for: lunch, dinner, Lively chain restaurant serving American seafood standards amid New England-themed decor. 5 mile(s) from Saltgrass Steakhouse, Full Service, Steak House, Open for: lunch, dinner, Award winning Steakhouse. 4.5 mile(s) from Chick-fil-A , Fast Food, American, Open for: breakfast, lunch, dinner, Fast-food chain serving chicken sandwiches, strips and nuggets along with salads and sides. 2 mile(s) from Outback Steakhouse, Full Service, Steak House, Open for: lunch, dinner, Boisterous Australian-themed chain serving steaks, seafood and other hearty steakhouse fare. Across the street from Mela Indian Bar & Grill, Full Service, Indian, Open for: lunch, dinner, Contemporary eatery with traditional, modern & vegetarian fare and a lunch buffet that varies daily. 1.5 mile(s) from Quiznos , Deli, American, Open for: lunch, dinner, Known for toasted, build-your-own subs, this counter-serve chain also sells soups, salads & more. Garden - 4.5 mile(s) from Olive Garden , Full Service, Italian, Open for: lunch, dinner, Lively, family-friendly chain featuring Italian standards such as pastas and salads, with a full bar. River - 13 mile(s) from Witte Museum, established in 1926 under the charter of the San Antonio Museum Association, is located adjacent to Brackenridge Park in Midtown Brackenridge, San Antonio, Texas, USA, on the banks of the San Antonio River. Theatre - 9.1 mile(s) from Majestic Theatre, is San Antonio's oldest and largest atmospheric theatre. The theatre seats 2,311 people and was designed by architect John Eberson, for Karl Hoblitzelle's Interstate Theatres in 1929. Safari - 29 mile(s) from Natural Bridge Wildlife, is a 400-acre safari park on the northern outskirts of San Antonio, near New Braunfels, Texas. The Natural Bridge Caverns is not affiliated but is located nearby. Rock climbing - 3.5 mile(s) from Malibu Castle Family Center, with mini-golf, go-karts, bumper boats, batting cages, rock climbing & a game room. Address: 3330 Cherry Ridge Dr, San Antonio, TX 78230. 8 mile(s) from The Shops at La Cantera, Chain known for unique gadgets, gifts & lifestyle items, such as electronics & travel accessories. The Shops at La Cantera Offers San Antonio's Top Shopping Experience. 40 mile(s) from San Marcos Outlet Mall, Outlet Malls in San Marcos. Via Intersate 35N, Exit 200. 8 mile(s) from Alamo Quarry Market, Airy mall home to major apparel & homewares stores, eclectic eateries & a cinema amid a modern site. 5 mile(s) from Ingram Park Mall, Classic mall featuring 150 stores, including major fashion chains, department stores & a food court. 6 mile(s) from NorthStar Mall, Modern complex supplying fashion-forward clothing shops, electronics & toys, plus department stores. 9 mile(s) from RiverCenter Mall, Historic riverside mall with fine & casual fare, trendy fashion shops, a comedy club & a cinema. 3.5 mile(s) from Best Buy , electronics retailer carrying cell phones and wireless plans, plus tablets and accessories. 6.6 mile(s) from SW Research Institute , one of the oldest and largest independent, nonprofit, applied research and development organizations in the United States. 11.5 mile(s) from Henry B. Gonzalez Convention Center, is in Downtown San Antonio, along the banks of the River Walk. The facility is the central component of the city's successful convention industry. 12.2 mile(s) from Japanese Tea Garden, near Brackenridge Park and the Sunken Garden Theater in San Antonio, was opened in an abandoned limestone rock quarry in the early 20th century. 11.2 mile(s) from Six Flags Fiesta Texas, is a theme park located on approximately 200 acres of land in San Antonio. 12.4 mile(s) from San Antonio Botanical Garden, is a 33-acre, non-profit botanical garden. 9.8 mile(s) from San Antonio River Walk, is a network of walkways along the banks of the San Antonio River, one story beneath the streets of Downtown San Antonio. 12.3 mile(s) from Fort Sam Houston, a U.S. Army post in San Antonio. Known colloquially as Fort Sam, it is named for the U.S. Senator, Texas Governor, and first President of the Republic of Texas, Sam Houston. 9.1 mile(s) from Spanish Governor's Palace, is a National Historic Landmark in San Antonio. 11.8 mile(s) from La Cantera Golf Club, located in the La Cantera district of San Antonio. The club played host to the Valero Texas Open, an annual tournament on the PGA Tour, from 1995 to 2009. It is owned by USAA Real Estate. 29.5 mile(s) from Natural Bridge Caverns, are the largest known commercial caverns in the United Statess. The name was derived from the 60 foot natural limestone slab bridge that spans the amphitheater setting of the cavern's entrance. 14.2 mile(s) from Mission San Jose y San Miguel de Aguayo, is a historic Catholic mission in San Antonio. The mission was named in part for the Marquis de San Miguel de Aguayo, Jose de Azlor y Virto de Vera. 13.0 mile(s) from Splashtown San Antonio, is a water park located in San Antonio. Its most recent name was Splashtown USA. - host to a variety of events including sports and concerts. 13.2 mile(s) from Freeman Coliseum, host to a variety of events including sports and concerts. 11.6 mile(s) from Alamodome, is a domed 65,000 seat, multi-purpose facility used as a football, basketball, baseball stadium and convention center. It is located on the southeastern fringe of Downtown San Antonio. 10.2 mile(s) from Blue Star Contemporary Art Museum, is the incubator for contemporary art in San Antonio. 8.8 mile(s) from Mi Tierra Cafe Y Panaderia, is a landmark Mexican cafe & bakery with classic fare, margaritas & mariachis in festive digs, open 24/7. 218 Produce Row, San Antonio. 9.4 mile(s) from Tower Life Building, is a landmark and historic skyscraper in Downtown San Antonio. 9.6 mile(s) from San Antonio Museum of Art, is located in downtown San Antonio. 9.1 mile(s) from Majestic Theatre, is San Antonio's oldest and largest atmospheric theatre. 12 mile(s) from The Alamo , is also called The Alamo Mission in San Antonio and originally known as the Mission San Antonio de Valero, is a UNESCO World Heritage Site. 9.2 mile(s) from San Fernando Cathedral, is a cathedral of the Roman Catholic Church located in downtown San Antonio. It is the mother church of the Archdiocese of San Antonio and the seat of its archbishop. 11.8 mile(s) from San Antonio Zoo, the San Antonio Zoological Gardens and Aquarium is an Association of Zoos and Aquariums accredited zoo in midtown San Antonio. The 35-acre zoo has a collection of over 3,500 animals representing 750 species. 11.2 mile(s) from SeaWorld San Antonio, is a 250-acre marine mammal park, oceanarium and animal theme park, located in the Westover Hills District of San Antonio. 14 mile(s) from San Antonio Missions National Historical Park, is a National Historical Park and World Heritage Site preserving four of the five Spanish frontier missions in San Antonio. 11.0 mile(s) from Menger Hotel, is a historic hotel located in Downtown San Antonio. 12 mile(s) from Tower of the Americas, is a 750-foot observation tower/restaurant located at HemisFair Park on the southeastern portion of Downtown San Antonio.